It may feel balmy in many parts of the world right now, but it’s only a matter of time before we break our cold-weather gear out of storage. To make sure everyone stands a fighting chance against Old Man Winter, Volcom is teaming up with the National Coalition for the Homeless to outfit folks who lack the means to buy new jeans or outwear. As part of its third annual “Give Jeans a Chance” campaign, the American apparel label aims to collect and distribute 50,000 pairs of jeans and jackets to homeless shelters worldwide. Watch the video below to go behind the scenes. Anyone who’s outgrown their dungarees or coats can drop them off at their local Volcom store or start a collection drive of their own. As an added incentive, the person with the most buzzed-about effort will receive a $1,500 donation to a school or nonprofit of their choice, along with $500 in Volcom gear and a commercial spot on Fuel TV. So go ahead and give jeans a chance—you have nothing to lose and everything to give. It may feel balmy in many parts of the world right now, but it's only a matter of time before we break our cold-weather gear out of storage. 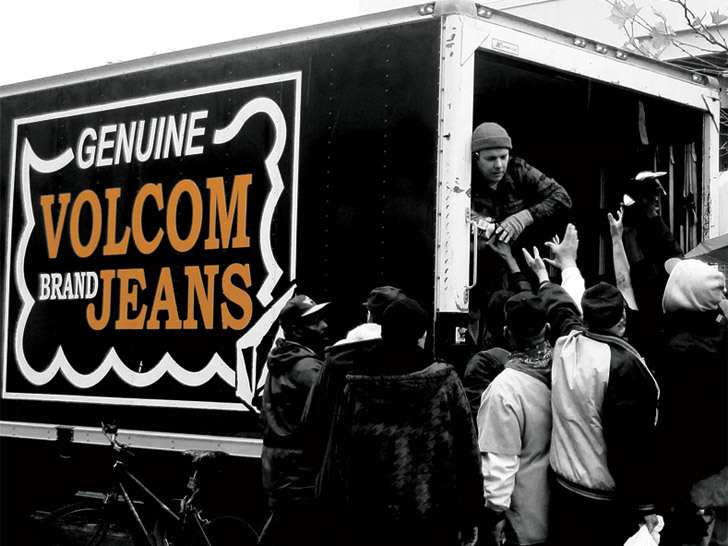 To make sure everyone stands a fighting chance against Old Man Winter, Volcom is teaming up with the National Coalition for the Homeless to outfit folks who lack the means to buy new jeans or outwear. As part of its third annual "Give Jeans a Chance" campaign, the American apparel label aims to collect and distribute 50,000 pairs of jeans and jackets to homeless shelters worldwide. Watch the video below to go behind the scenes.